Audiology Services – What Should I Expect From My Appointment? Whether you come to see the audiologist for a hearing test, hearing aid cleaning, or custom hearing protection, our objective is to make you as comfortable with the visit as possible. From our initial phone conversation to your arrival at our warm, friendly office your positive experience is our goal. When making an appointment we like to consider what type of appointment best suits your needs. A comprehensive health history will be taken. This will mainly focus on your hearing health care, noise exposure, family history of hearing loss and current hearing needs. Next, we will take a look at your ears using a regular or video otoscope. This allows us to see any debris or issues up to the point of the ear drum. Tympanometry is then used to measure the performance of your ear drum and the bones of the middle ear and is performed using a small comfortable probe that goes into the ear canal. Off into the sound booth we go! Pure Tone Audiometry is used to test each individual tone, one ear at a time. You will sit in the booth pressing a button whenever you hear a tone. We are looking to find the softest level that you are able to hear a tone at various pitches. Speech Discrimination testing is performed to measure how “clearly” you hear a sound. This is one of the most important parts of the hearing test, and is simply repeating words you are hearing on a recording. Bone Conduction Testing is the last part of the hearing test. It is performed using a small headband we place over your head. It is useful in bypassing the middle ear and showing us if your hearing loss is related to a middle ear problem, or a nerve problem. Once the hearing test is complete, we will have you come out of the sound booth and we will go over the various parts of the test together. It is important to look at the big picture of all tests combined when discussing hearing loss. Once we have discussed the outcome of the hearing evaluation, we can discuss the next steps. These can vary from patient to patient and may involve recommended hearing protection, hearing aids, and sometimes a referral to an ear specialist like an Ear, Nose and Throat Physician. Chances are if you have found yourself on my site, you or someone you are close to has a hearing loss. One common sign of a hearing loss is that you can hear but not understand what your friends and family are saying. You may notice you have difficulty in background noise, or that those around you seem to mumble. These are all normal signs of hearing loss, but it is also normal to treat the issue. It all starts with a conversation and a hearing evaluation. 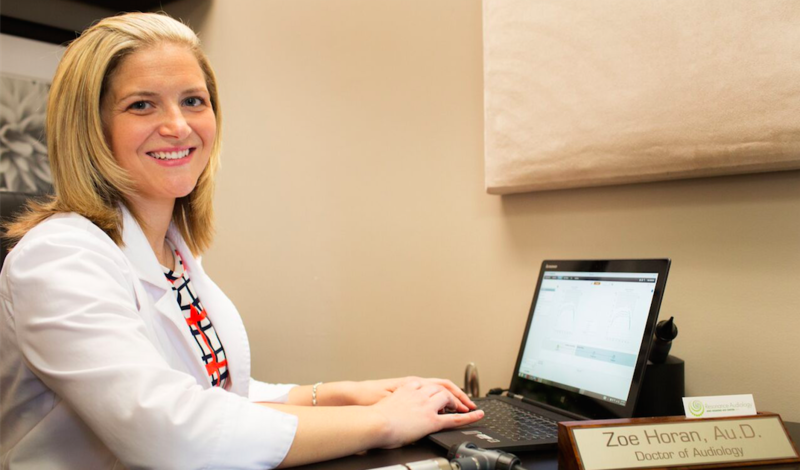 My role as your audiologist is to start the process of hearing better by providing an excellent, comprehensive evaluation of your hearing and listening needs. Here at Resonance Audiology, our goal is to find the best solution for your hearing and communication difficulties. For some, that solution is hearing aids, and for others the solution may be a device that will simply allow them to improve their hearing on the telephone. Our promise is to explore the best solutions to meet your communication needs, as well as your budget. My promise to you is to treat you and your family how I treat my own family members with hearing loss. As the wife of someone with hearing loss, I take the role of hearing care provider very seriously. Whether you are seeking help with hearing protection, or help with a hearing difficulty, Resonance Audiology and Hearing Aid Center is here to provide personalized, local care with unsurpassed technology. Come see us today and start hearing life.